His geological education made him aware of the controversy surrounding the origin of fossil molluscs (still considered more as curiosities than valuable stratigraphic tools) and large vertebrates found in the Permafrost soils of Siberia. In 1789 he had the opportunity to have a look on the first fossil pterosaur skeleton. During his famous expedition to America (visited from 1799 to 1804) he collected fossil bones and sent them to palaeontologist Cuvier. He also collected fossil molluscs for fellow German geologist Von Buch, and he even directed paleontological excavations near Bogotá. In 1833 the school director and amateur archaeologist F. Sickler noted some strange depressions in a slab used in the laying of the foundation wall of a small garden house in the village of Hildburghausen (Germany). The slab was badly damaged and Sickler was not sure what this strange fossil may be. Sickler promised to the workers in the local sandstone quarries a reward if they could provide a better specimen - and so one year later Sickler was able to publish a short account on a new slab with three distinct types of footprints, maybe from some ancient amphibious animal. He "invited" the greatest geological minds of the time (including Humboldt) to study this strange fossil. 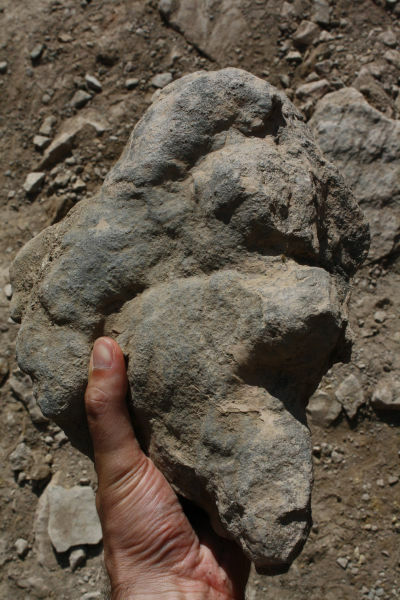 The discovery excited a larger public, as some imprints resembled a human hand - today these ichnofossils are known as Chirotherium ("the hand-beast"). Fig.1. A mid-nineteenth century fanciful view of the unknown Triassic trackmakers: a labyrinthodont amphibian leaves a Chirotherium trackway watched by some primitive reptiles (from the Benjamin Waterhouse Hawkins archive, Natural History Museum, London). Fig.5. The mid-nineteenth century fanciful view of the trackmakers: a labyrinthodont amphibian (centre) leaves a Chirotherium trackway watched by dicynodonts (left) and rhynchosaurs (right). In a note read to the Academy of Sciences of the Institute of France in the year 1835 Humboldt made public his opinion on the mysterious fossils of Hildburghausen. He considered the imprints as real fossil trackways (some geologist, like Von Buch doubted at first this interpretation) and he considered the ancient trackmaker more similar to a mammal than an amphibian. Based on the toe configuration, Humboldt imagined at first a marsupial, possibly an arboreal possum-like creature (this idea was based on the imprint of - what Humboldt tough - an opposable toe in the Chirotherium tracks). Despite an expert in reptilian anatomy (he had observed caimans along the shores of the Orinoco and studied a Nile crocodile in an Italian collection) he didn´t recognize any similarities between Chirotherium and modern reptilian footprints. The identification of Chirotherium as fossil mammal tracks was at the time a scientific sensation, at it would have significantly pushed mammals into deep time (from the Tertiary to the Triassic). However Humboldt´s analysis attracted little interest by contemporary naturalists and the opinion of British palaeontologist Richard Owen - Chirotherium made by a larger reptile - prevailed. In fact even Humboldt in his later work "Cosmos" (published in various volumes between1845-1862) doesn´t mention his research on ichnofossils and even notes that the earliest mammals are found only in Jurassic sediments. It´s not entirely clear why Humboldt, famous for his general interest in all earth sciences, showed so little interest in this subject. Maybe he considered his knowledge too limited, as his preliminary analysis was based only on a specimen displayed in the mineralogical cabinet of the Natural History Museum of Berlin, to engage in a scientific discussion. Maybe he was also more interested in presenting this puzzle to the scientific community, awaiting that others should solve this ancient mystery.